When we first met this adorable couple, everything just clicked: our personalities, our interests, and our vision. We ordered bagels and proceeded to chat for four hours without realizing how much time had passed. No, that's not the length of an average consultation and yes - True Story. Now Chad and I believe that true love, long-distance, can work and is totally worth it. We, ourselves, had a long-distance friendship then relationship, so we have firsthand experience with the late night "I miss you + can't wait to see you soon!" phone calls and traveling hours back-and-forth for visits. When they told us their love story, we could not stop smiling: Sherri is originally from Maryland and Nate is originally from Oklahoma. The two met, became friends, and fell in love. After many flights back and forth, Nate decided he wanted to be with Sherri forever. He telephoned her parents for permission, packed his bags, and drove his car halfway across the country to ask her to be his wife. (Seriously, how adorable is that?! 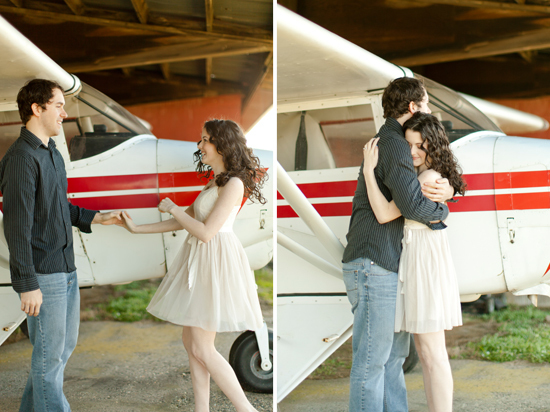 )That said, we began throwing engagement session ideas back and forth for a travel themed session. We stumbled upon a private local airport and, after contacting the owner, we settled on the location as a perfect spot for their photos. 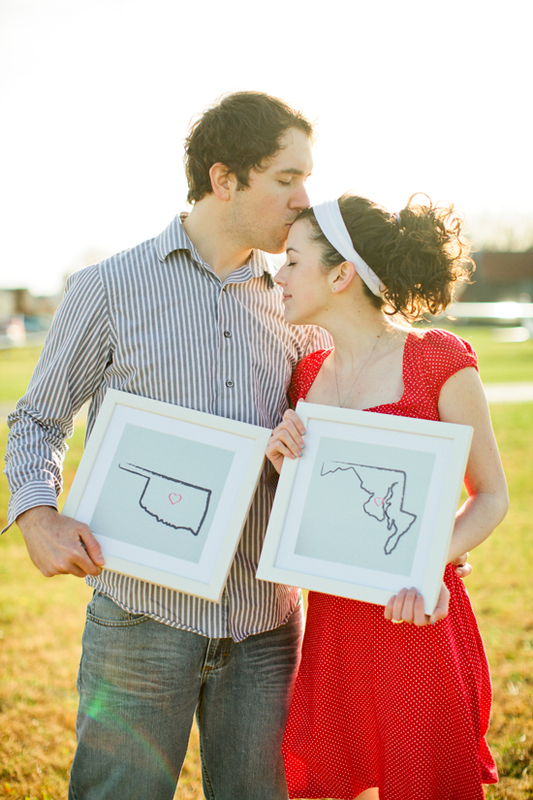 The two brought along some vintage suitcases, maps, and even created + framed outlines of their home states (with hearts representing the city) to help visually tell the story of their long-distance love for one another. Simply perfect.